Everyone was impressed with Sebastian Vettel's drive to fourth place in China but we should spare a thought for Robert Kubica too. He was leading the race when the BMW's hydraulics decided to give up the ghost. Robert was on a one-stop strategy and was in with a good chance of still being in front at the end, so it was as crushing a disappointment for the Pole and his team as was Hamilton's retirement in a gravel trap. This was a race in which timing was everything. If the one-stoppers got that right, they were looking good; get it wrong and they disappeared amongst the also-rans. The relative fortunes of the BMWs are a good illustration of this. Their performance was below par in Shanghai and it was the timing of his change from intermediate to dry tires that enabled Kubica to lead. Nick Heidfeld was on a similar stategy to begin with but opted for another set of intermediates at his pit stop. When the rain refused to arrive as expected, a second stop for dry tires was necessary and this left him fighting with Liuzzi for sixth. A battle between a BMW and a Toro Rosso would normally have been decided very quickly in the BMW's favor but on this circuit, in these conditions, it was a hard fought tussle that Liuzzi won in the end. This was an excellent illustration of how the race turned the form book upside down for some teams. Vettel had an excellent drive in that he made the most of the sudden competitiveness of the Toro Rosso and a perfectly timed pit stop but we should keep things in perspective by remembering that Liuzzi would have been in his place had he opted for the same strategy. Vitantonio's driving, in fact, was just as commendable but under considerably more pressure. With the same chassis as Toro Rosso, Red Bull should have done well too but managed to confuse themselves badly with tire changes and timing. Coulthard was going well but switched to dry tires just before the rain and lost time as a result. Eighth spot at the end was less than he had hoped for from such a promising qualifying performance. And Webber made the mistake of swapping back to wets after his change to dry tires, forcing yet another pit stop when the rain lasted for so short a time. Honda was another team that demonstrated the importance of timing and strategy. Jenson Button was lost in the midfield in the wet but was first to change to dry tires and the Honda came alive immediately. With a great drive through the field, Jenson was able to get as high as fifth by the end. In contrast, Barrichello had a nightmare race, struggling near the back in the rain, then changing to dry tires but deciding to change again when the rain returned. This necessitated a third stop and he finished in 15th place. Inevitably, the main talking point afterwards was Hamilton's trip into a gravel trap so small as to have passed unnoticed by many. He must have felt like the man who walks into a tree on Australia's Nullarbor Plain or stubs his toe on the only rock for miles. There was plenty of other drama, however, and the result leaves the championship open with just one more race, the Brazilian GP, to go. As entertainment, the Chinese GP was excellent; as a race, it had its moments too, particularly Raikkonen's chase of Hamilton in the first half. On this evidence, we should hope for rain at all future races in Shanghai. Gotta say I really enjoyed a good lot of the race, makes a change. Raikkonen and Hamilton's fighting in hard conditions was particulaurly entertaining, watching both Cars slip and slide as they attempt to actually pass - amazing. Reading the sport column today on Hamilton's trip into the gravel trap, a lot of the blame is going on McLaren. I have to say I don't agree with this, they were looking for an obvious advantadge in a race where it's very hard to find one, this is racing though, if it worked and Hamilton destroyed the competition they would of looked Genius. It of course was Hamilton's mistake too that put him in the gravel trap, you can't argue with that, on tyres like that you have to tip-toe, sometimes we forget it's his first year. I thought Raikkonen, did well obviously doing his best on a circuit where McLaren seemed to have a good advantadge on the twistys, from what I could make of it. Although in a way I'm glad Hamilton came off and made it a 3 way fight for the title in Brazil, it should be good to see hopefully a race where both Raikkonen and Alonso need to aim as high as possible. Although chances look slim for both, especially Raikkonen would Hamilton at the very least needing to finish (6th I believe because Raikkonen has won more races)? Something like that anyway. Although I still hope for Raikkonen to win the title, I feel he more than deserves it over the years in which in my opinion he's been the fastest driver out there, that horrible thing called luck has just plagued him, I think it would be fitting for him to win. 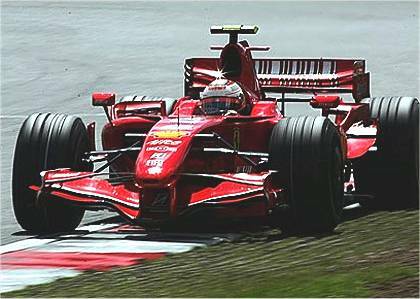 It's certainly true that Raikkonen has had little good luck over the years. It remains to be seen whether that will change in Brazil. As for Hamilton's little escapade in the gravel trap, I think the team must bear some of the responsibility. They kept him out on worn tyres for far too long, all for strategy reasons - did it not occur to them that a blown tyre would have ruined Hamilton's championship chances as well as perhaps resulting in a serious accident? Everyone could see that the rear tyre was completely worn through. There was no need for him to win the race, he could have finished 5th and still won it (in an undramatic fashion). Hamilton is a racer, we cant expect him to just settle for points, it should have been up to the team to calm him down and make sure he finished. That being said, I have gained respect for him, that cannot be an easy thing to go through and he handled it with class. He did not blame his team or his mechanics, and he came out and watched the race with them rather than sit in his trailer away from the cameras. It seems like Alonso really brings out the worst in him and vice versa. I still hope that Kimi can pull off the miracle, but if Hammy does win it, my face will be a little less contorted than it would have been had he won in China. I'm backing Kimi too, partly because of the way he's handled his Ferrari situation this year and just raced because he loves to, keeping out of the politics and just racing.